US, OAS, Brazil recognise Venezuelan opposition leader Juan Guaidó as president in a politically explosive move, after National Assembly chief declares himself interim leader of troubled nation. Argentina will follow suit in the coming hours, say officials. Argentina will join the United States, the Organisation of American States (OAS) and a host of other nations in recognising Venezuelan opposition leader Juan Guaidó as the country's president, in a politically explosive move that deepens the troubled nation's crisis. Officials at the Foreign Ministry confirmed to a number of local outlets – including TN, Infobae and Clarín – this afternoon that President Mauricio Macri's administration will recognise Guaidó, though that announcement will likely follow on from talks involving members of the so-called Lima Group, a collection of regional powers which has opposed President Nicolás Maduro and requested he step down from office. In a day of protests in the crisis-stricken country, Guaidó – the leader of Venezuela's National Assembly – controversially declared himself Venezuela's interim president in a defiant speech before masses of anti-government demonstrators, who took to the streets on Wednesday to demand Maduro's resignation. He immediately drew recognition from the Trump administration in Washington, which said it would use the "full weight" of US economic and diplomatic power to push for the restoration of Venezuela's democracy. Trump described President Maduro as "illegitimate" and said the National Assembly, headed by Guaidó, is "the only legitimate branch of government duly elected by the Venezuelan people." US Secretary of State Mike Pompeo said in a separate statement that Maduro should "step aside in favor of a legitimate leader reflecting the will of the Venezuelan people." The Organisation of American States quickly followed suit in recognising the interim leader, with its Secretary General Luis Almagro offering his congratulations to Guaidó for the bold move. "Our congratulations to Juan Guaidó as the president in charge of Venezuela, he has our recognition to promote the return of the country to democracy," wrote Almagro, a fierce critic of the Maduro regime. A few minutes later, Brazil added its backing to the National Assembly chief, with President Jair Bolsonaro declaring via Twitter that Guaidó is "the president in charge" of the country. The Brazilian leader promised to "politically and economically support the process of transition." From the World Economic Forum in Davos, officials from Colombia, Peru, Ecuador and Costa Rica all said they too would recognise Guaidó. Indicating the difficulties that lie ahead for Guaidó and his attempt to lead the nation, Venezuela's Supreme Court of Justice (TSJ) said in a statement that it had ordered the General Prosecutor's Office to investigate the members of the opposition-controlled National Assembly, with a view to opening criminal charges against them. Raising his right hand in unison with tens of thousands of supporters, Guaidó, the head of the opposition-controlled National Assembly took a symbolic oath before God to assume executive powers he says are his right under Venezuela's Constitution and take over the presidency until new elections can be called. "Today, January 23, 2019, I swear to formally assume the powers of the national executive as president in charge of Venezuela," he told the cheering crowd standing before a lectern emblazoned with Venezuela's national coat of arms. 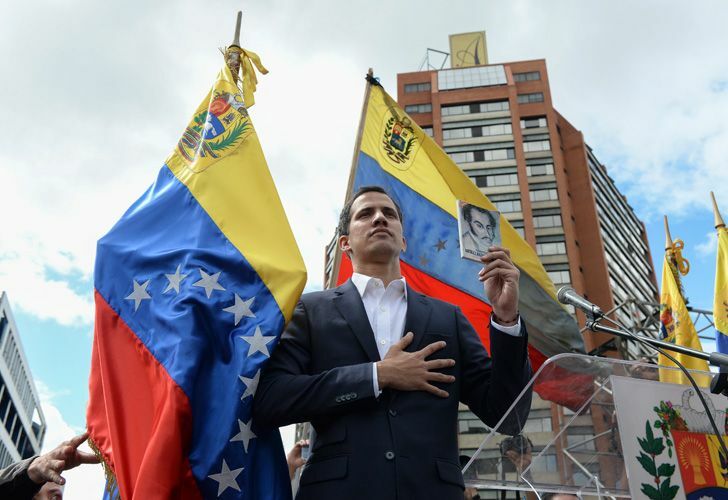 Guaido said he was taking the politically risky step just two weeks after Maduro took his own oath to a second, six-year term confident that it was the only way to rescue Venezuela from "dictatorship" and restore constitutional order. He asked for elections within 30 days. "We know that this will have consequences," Guaidó, 35, told the cheering crowd. "To be able to achieve this task and to re-establish the Constitution we need the agreement of all Venezuelans." He said he had taken the decision to "achieve the cessation of the usurpation, a transitional government and to hold free elections." The declaration came as tens of thousands of anti-government demonstrators poured into the streets Wednesday accusing embattled Maduro of usurping power and demand he step down as the country reels from a crushing economic crisis forcing millions to flee or go hungry. Large crowds of protesters gathered in Caracas waving flags and chanting "Get out Maduro!" in what was the largest demonstration since a wave of unrest that left more than 120 dead in 2017. Pro-government demonstrators dressed in red in support of Maduro were also marching in the capital, at times crossing paths with opposition protesters and shouting "sell outs" and "traitors." National guardsmen launched tear gas at anti-government protesters in the middle-class neighbourhood of El Paraíso but for the most part the marches continued without conflict. "Join us!" the protesters cried out to a line of officers wearing helmets and carrying shields. "You are also living this crisis!" The protest is considered a crucial test for the opposition as it seeks to send a forceful message that Maduro no longer has the people's backing and appeals to the military and the poor to shift loyalties that until recently looked solidly behind the president. The protests were called to coincide with an historic date for Venezuelans — the anniversary of the 1958 coup that overthrew military dictator Marcos Pérez Jiménez. "The democratic forces are here advancing," opposition leader María Corina Machado said as she marched. "Not so that Maduro changes but so that he leaves." US President Trump in a statement called on other Western hemisphere governments to join him in recognising Guaidó. "The people of Venezuela have courageously spoken out against Maduro and his regime and demanded freedom and the rule of law," Trump said. The demonstration comes after a whirlwind week that saw an uprising by a tiny military unit put down by government forces, fires set during protests in poor neighborhoods and the brief detention by security forces of Guaidó, the newly installed head of the opposition-controlled congress. Over the last two nights, Venezuelans angry over their country's spiralling hyperinflation, and food and medical shortages have gathered in the streets banging pots and pans and setting up barricades in protest. In the city of San Félix, residents set fire to a statue of Maduro's mentor and predecessor, the late Hugo Chávez. In the southern city of Ciudad Bolívar, a 30-year-old worker, Carlos Olivares, was killed when four unidentified men descended from a beige Jeep and fired upon a crowd that was looting a store. Two more unidentified people were also killed, according to a police report of the incident, while two were injured. For much of the past two years, following a deadly crackdown on the 2017 protests and the failure of negotiations ahead of last May's boycotted presidential election, the coalition of opposition parties has been badly divided over strategy and other differences as millions of desperate Venezuelans fled the country's hyperinflation and widespread food shortages. But buoyed by unprecedented international criticism of Maduro, anti-government forces have put aside their infighting and are projecting a united front. Guaidó, who is taking the reins from a long list of predecessors who have been exiled, outlawed or jailed, was dragged from an SUV just over a week ago by intelligence agents but was quickly released amid an international outcry. In the run-up to Wednesday's protests, the defiant young lawmaker crisscrossed Caracas attending outdoor assemblies known as "Open Cabildos" — for the revolutionary citizen councils held against Spanish colonial rule — pumping up crowds by arguing that Maduro must go for democracy to be restored. "We are tired of this disaster," he said Monday from the roof of a college building. "We know this isn't a fight of a single day but one that requires lots of resistance." An enthusiastic crowd of students answered with shouts of "Freedom!" Driving the crisis was Maduro's decision to ignore international opposition and take the presidential oath on January 10 for a second term widely considered illegitimate after his main opponents were banned from running against him. Guaidó has been targeting his message to Venezuela's military, the traditional arbiter of political disputes. Maduro, who lacks the military pedigree of his mentor, Chávez, has sought to shore up support from the Armed Forces by doling out key posts to top generals, including heading the PDVSA oil monopoly that is the source of virtually all of Venezuela's export earnings. He has also been playing commander in chief, appearing last week at a military command meeting wearing camouflage fatigues and receiving the blessing of the defence minister, General Vladimir Padrino López. Distubrances continued into Tuesday, with small pockets of unrest in a few working-class neighborhoods where the government has traditionally enjoyed strong support. More violence was reported Tuesday night. "People are tired of so much misery," said Carmen Marcano, holding up her shirt to show seven buckshot wounds suffered during the clashes in the Cotiza slum next to where the rebellious guardsmen were captured. Retired major general Cliver Alcalá, a one-time aide to Chávez and now in exile, said the opposition's newfound momentum has reverberated with the military's lower ranks, many of whom are suffering the same hardships as regular Venezuelan families. "I am absolutely certain that right now, especially younger troops are asking themselves whether Maduro is their commander-in-chief or a usurper," Alcala said. "As we say in the barracks, hunger is the only thing that can devour fear of the government." Maduro has accused the opposition of inciting violence with the aim of provoking a bloodbath. Top socialist leaders have threatened to unleash on demonstrators motorcycle gangs of pro-government die-hards known as "colectivos." "I demand the full rigour of the law against the fascists," Maduro said Tuesday night, blaming what he called "terrorists" allegedly linked to Guaidó's Popular Will (Voluntad Popular) party for a fire at a cultural centre named for a pro-government lawmaker murdered in 2014. He also accused US Vice-President Mike Pence of trying to foment a coup after Pence released a video pledging support, in Spanish, for the planned demonstrations. "The government is resorting to its old tricks, but the people no longer believe them," Pantoulas said. Venezuela is mired in a serious political and economic crisis that has forced 2.3 million people to leave the country since 2015, according to the United Nations. The crisis in the oil country has caused widespread shortages of food and medicine and, according to the International Monetary Fund (IMF), inflation in 2019 will reach 10,000,000 percent. Protests are expected locally today by Venezuelans resident in Argentina, who will be demanding Maduro leave office. In the City, at 6pm, groups are expected to gather at the Plaza Vaticano, in front of the Teatro Colón opera house, while at the same time Venezuelans will also gather at the Rambla in Mar del Plata.